Did 2011 seem about four months long? If it were an all-you-can-eat salad bar, I’d want a refund. It went by so fast I think I only got to the pickles. This month I’ve been more sleepy and fatigued than usual. It might be recovery from traveling the last few months. Or it could be this little thing called RA. Whether it’s due the year’s end or fatigue, sometimes I sit in my rocker and gaze into space. Thinking about all the things that need to be done for patients. And making sure people can find more than the pickles in their rheum care. I know I’m one girl with a big voice, but I’m still just one girl. I always say, Together we can do more. That’s why we created the Rheumatoid Patient Foundation to accomplish the things that patients say they need. If you’ve ever wanted to help, please click here and read about what you can do right now! 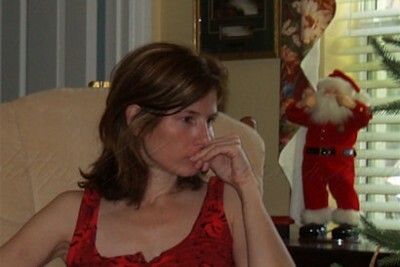 Postblog: Yes, it was hot enough to wear a tanktop at Christmastime. And my daughter took an unauthorized pic of me gazing with fever and dirty hair. But, hey, it’s real. 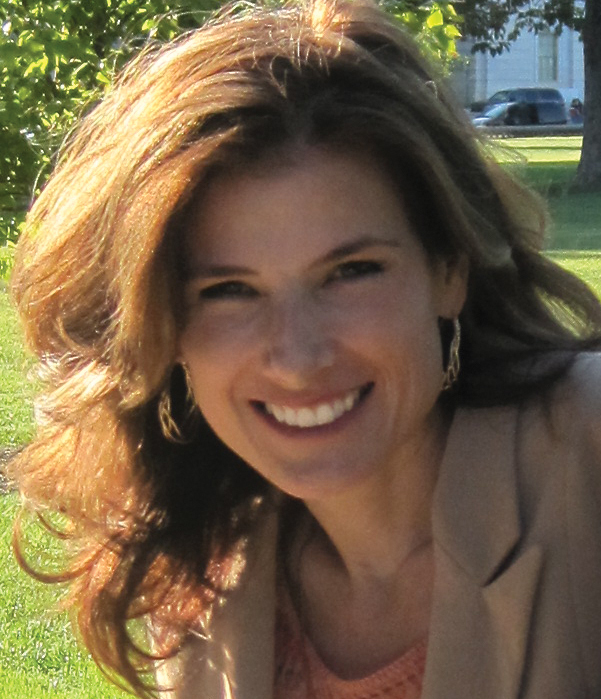 Success news from the Rheumatoid Patient Foundation – & how you can help! Thank you for the reminders Kelly. #5 is particularly relevant to me at the moment. I’m at the point where full time employment is using every last drop of my precious energy (and ALL of my spoons). I’m very fortunate to have a supportive spouse, who encourages me to give up my job if necessary. I don’t know what is in the balmy Florida air..but I have been running the low grade temps every night and falling asleep just about any time I sit down. The other day I nodded off in the car just coming home the 8 blocks from the grocery store..Thank goodness my son was driving! The odd thing is that I am having minimal pain while having the temp and fatigue. All of us who love you and the “hope” you have given us with your words and this website, know that the biggest benefit here is that we can all be honest and “real” as we recite our various trials and tribulations of the day…. 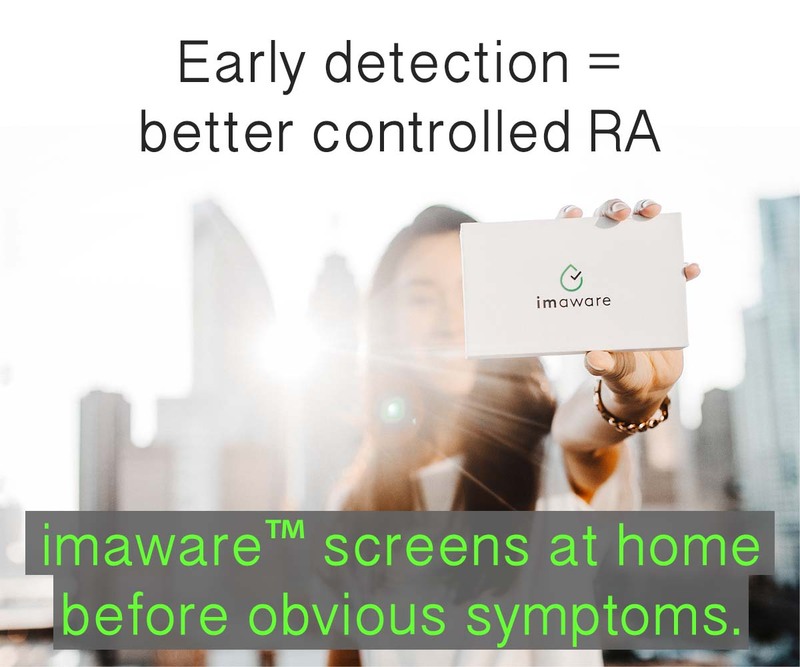 On days when doctors, and perhaps family and friends , aren’t truly cognizant of what RA patients are going through, RA Warriors understand and sympathize and support each other’s bad days. You are the leader of the group, and , without your leadership, many would be lacking the “ear” and support from others that they need so much at tough times. Hope you will be feeling better soon! I hope you had a lovely holiday Vi!! Love to your family! I actually love that picture of you Kelly! I am dragged out too. I have been on high adrenaline for the last couple of weeks and now I am done in. Isn’t it funny that after 4 years I still will ask my husband or friend, “What do you think is wrong with me? I just feel awful like I have the flu.” Then I remember, ugg, I have RA. But, it still is hard for me to get it in my head that this thing called RA can really do this to you. I don’t know if I ever will. This is such an allusive disease because it is so hard to get a mental handle on it. Kelly – yes this year flew by – this post really hit home – I struggle everyday with a spouse who doesn’t fully understand and when he makes comments about me needing to find a job I go upstairs and have a cry – I had to close my part time business because I could not do physically, and it has put me in a funk-I have started to consider going on disability there is so much I want to do or think I can then I cant get up in the am very well and can barely get things done at home- agh – thanks for providing us with a forum to let me vent. hope you feel better and best wishes for the new year. I’m glad to be getting to know you bit by bit Kelly. It’s fun to have a friend with the same name too. Best wishes for your new year too. Love the picture. To me you look beautiful. That has been me many a day. Just sitting, staring, wondering how am I ever going to get out of this chair and do anything. Thanks for being real. It helps. THANK YOU FOR UNDERSTANDING! That’s just how it is sometimes – thinking of all the things I want to do and wondering if I ever can! Can I add just one more…lack of proper pain treatment for ra. How many stories and emails I have received about this and the loss of life (yes three I know of this year alone that committed suicide due to the severe pain and lack of treatment for the pain…just typing this makes me want to cry…yet again). It is a complete disgrace how we are targeted as drug seeking freaks if one mentions narcotic pain meds for treating ra. This is a sin in my book and the medical community needs to be educated and changes need to be made so they don’t fear losing their license for treating true patients in true pain. There is a true difference between addiction and dependance. I don’t need to be educated, instead the medical community needs a true leader in this arena. Yes, the medical community needs to be educated. I’ve spent the last week writing a long piece about that for another site – I’ll post a link when it goes up – that is what the RPF is doing and will do. There are good docs and researchers on our side and our side is “right” so we will prevail. – as you say, there are lives at stake in more ways than one, Deb. Welcome Becky! I’m so glad you found us! I was just recently diagnosed with RA, and while in my doctors office saw the article on you in WebMD. I couldn’t wait to get home and look it up. This site is fantastic! There is so much info on RA and it makes me feel sane knowing that what I have been going through is a very real thing, if you understand what I mean. I just kept saying over and over “what is wrong with me”. Now I have some answers and I want to be informed and to help others as well. This is the site to do just that. Thank you for your time and effort! Welcome Debbie! Would you believe I get hundreds of letters saying the same thing? No, there’s nothing wrong with you – well, RA is wrong! We’re working hard to make ways for everyone to be involved and help as many people as possible! Hey, Kelly … Happy New Year! It’s been a while — literally months — since I dropped in on RA Warrior. 2011 was a very hectic year for me. My husband was transferred to another state, with his job. Although a promotion, we had to move in 6 weeks! That’s go to another state … find the right house in the right neighborhood … buy the house … pack-up the old house … move … sell the old house, etc. As you can imagine, it was crazy. Somehow, by the grace of God, I did it despite my RA! Pacing yourself IS GOOD. Realizing your kids are functioning adults who can handle more than you think IS even BETTER! Our new home has a warmer climate & that has helped me significantly. The new house is all on 1 level — another plus when battling RA. After taking Methotrexate for 21 months, my rheumatologist gave me really good news in December: I appear to be in remission! We have to wait 90 days … take more bloodwork … to be sure. Anyway, I am entering 2012 with a lot of joy & optimism. For the first time in a long time (my problems started with Fibromyalgia in 2000, then the RA diagnosis in 2010), I wake-up with minimal stiffness. I’m 52, so I don’t expect to feel like I’m 25. Living doesn’t require pain meds. I walk 4-8 blocks every day. And I can remember when walking to the end of my driveway was tiring. I know remission with RA isn’t like remission with Cancer. It isn’t totally gone from my body. I know it won’t last forever, but … for now, life is pretty darn great! 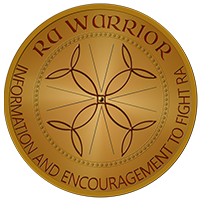 To all the other RA warriors out there, my best wishes. Don’t ever, ever quit! To you especially … thank you. You were more support to me than you will ever know! Hi Julie. happy new year! Thank you for the greeting. I so agree about the “kids” – no way I’d have made it w/out them. It’s not that walking, etc tires me as much as it’s so hard to go on and on ignoring the joint pain – eventually the joints all just refuse no matter how much the mind insists. I’ll enter 2012 with optimism too that one day I’ll have some days that are not as bad – I know that everything in life changes – and RA certainly does in most people – so mine will too – maybe this year. The expression on your face is so familiar. The recent fatigue may have resulted from trying to keep everyone happy during the holidays and not taking time for yourself. We buckle under the pressure of participating in too many activities when we should sometimes just say,”NO, I’ve got to rest”. All of the crazy changes in weather we’ve had in Florida recently don’t seem to help the situation with our bodies either. Take care! Kelly, I see you in the picture and your look is sooo familiar! You are STILL a beautiful person, inside and out. For you to have the strength to actually set up and monitor a site like this is simply amazing! I am fairly new to the site, just a couple of months, but I have found it so helpful. Not just the info, but the knowledge that I’m not alone in this fight and that there is no “typical” RA patient! It’s good to have a community where we are just ourselves and no one judges us for our “weakness”. Sometimes, for me, it’s the low grade fever and extreme tiredness that seems to well up from no where that really gets to me. As others have stated, there is SO much I want to do, but just don’t have the energy to do it! It certainly is another way of life, isn’t it! I am fortunate that I don’t have to work outside the home anymore so I’m at least not dealing with THAT! Heaven help those who still have to struggle with that issue everyday! Thank you! It helps me to hear from you too! I never have used the daily fevers as an excuse for how hard it is to do things, but maybe I should – you are right about how much it wears on a person. I was diagnosed with ra when I was 21, I am now almost 63, and frankly it is starting to get me down. I have lost 2 husbands who said they did not want to be married to a cripple. I had a daughter when I was 21 who lived one short month. One month after she died I was diagnosed with ra. I now have 2 wonderful kids a daughter 31, and a son 25. Kelly, you look beautiful to me in this picture. I don’t see dirty hair, nor do I see your pain. But I do understand your pain. Fortunatley we talk of my pain being less than yours, but I do understand those with great pain as you. When you have RA,those of us with less pain, are always waiting for the other shoe drop, while you must be always waiting for a storm of shoes to fall on you!! You know how much I love you. You are touching thousands of people so don’t forget how beautiful you are!! Now, one more thing, I hate the RA pharma ads. I want to smack Phil Mickelson for doing the ad, POOP ON HIM!! take care and keep smiling! !